Stephanie (shown) "is a highly realistic (the finest we’ve smelled) recreation of the headspace of the gardenia flower and is not for the faint-hearted". Additional notes include pink pepper, black pepper, galbanum, angelica root, sambac jasmine, tuberose, and chrysanthemum. Yvette is a "complex fantasy floral/gourmand fragrance with a butterscotch, plummy aspect". Notes include vanilla, ivy leaf, plum, genet flower, everlasting absolute, orchid, heliotrope, nutmeg, ambergris, cedar, sandalwood, mousse de chine, vanilla, styrax and tolu. Genviève is a "classy, unabashedly feminine rose-family floral fantasy". The notes feature Damask rose, green tea, muguet, rhubarb, ambrette seed, Bulgarian rose, raspberry, peach, ylang ylang, mimosa, jasmine, violet leaf, angelica root, tolu, ambergris, musk, tonka bean, sandalwood and civet. 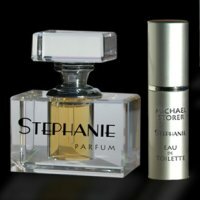 Michael Storer Stephanie, Yvette & Genviève are available in 18 ml Parfum ($92) or 10 ml Eu de Toilette Purse Spray ($30) at michaelstorer. You HAVE to be a floral lover who doesn't mind some sweetness in order to embrace “Steph.” The good news is that it really does smell fresh and alive, not syrupy or artificial. Nice sillage in my immediate vicinity (so I can appreciate wearing it), but doesn't throw so far as to affect others at a little distance. I sampled and am getting the parfum form. Not a little girl's scent — a beautiful flower for a woman. I love gardenia so look forward to trying it. Was your sample the parfum or EdT? That looks like the Jalaine bottle, doesn't it? Michael Storer? Why does that name sound familiar? Anyway, I love the smell of a real gardenia, so if Stephanie lives up the hype, it must be very beautiful. So far, most gardenia fragrances leave me very disappointed. Same bottle, R, and I saw it used by another brand recently as well (now of course, can't remember which one). His name might sound familiar because he got lots of interest on the boards (mostly basenotes & MUA) last year when he launched his men's scents. I think for a time he offered free samples (?) to everyone on both boards. The samples come as pure parfum, and that's the concentration I'm getting, courtesy of a swapping arrangement (glee!). I have to get around to asking Mr. Storer if he will sell refills of the parfum to put in that wonderful ice-block of a bottle. What nationality was your mother, if you don't mind telling us? I am French and I maintain that Genviève is not a French name. I assumed that it was supposed to be. There are lots of quirky spellings of common names out there. Hope I didn't offend you. Nice to hear his female scents are very good ones. I hated his men's scents. They are way too blah for my tastes. The men's scents have NO “Oomph” to them as one would hope for. I had received a few in a few swaps and immediately swapped them away.